Hi everyone, Have been around the forum for some time now, and have seen the pre-screened physician area, but am hoping for some advice and referrals of surgeons who have been getting good results for FUE crown procedures. 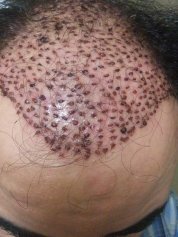 I’ve already had a 2000 grafts FUE crown hair transplant in Australia but am unhappy with the results due to low density. The doctor didn’t even focus on my crown and blended way too far into my existing hairline! 2 years later and my crown is still thin. After speaking to all the main hair transplant surgeons in Australia, I have concluded they are all low quality and shady. Therefore, I’m prepared to go overseas for my next procedure. North America is convenient, and I’m impressed with gallery pictures from Dr. Parsa Mohebi as well as Hasson and Wong. I’m thinking 500-600 FUE grafts (up to 1200 hairs) at 30 grafts per cm2 with an effective crown design should give me a significantly better cosmetic outcome than what I have now? Currently my crown looks ok when viewed from front and sides but looking from top and back it still looks quite thin/bald and that’s what I’d like to fix. Being in my early 30s and not on any medication (except PRP) I’m hesitant to use too much donor area since I haven’t touched my front hairline yet. Even though my hair loss seems stable and I have good density/coverage at the front, who knows what further procedures might be needed in the future. I’ve attached photos of: The day before my first transplant The day after the first transplant (showing in yellow where in my opinion grafts are still needed at a minimum) 3 x pics of my crown now 2 years post-surgery Appreciate any comments and feedback. Thank you. I would suggest looking for Dr. Otavio Boaventura who does a lot of long hair unshaven FUE or what they call Preview long hair. My guess is that the numbers ler session are lower so might need to do a more gradual approach. I think Dr. Parsa Mohebi in LA also does them. Best of luck! Damn you shaved 10 years off your face man congrats. I visited Dr. Mohebi a month ago and had the privilege to see him perform an FUE in person. I can definitely attest to his skill and efficiency. Thanks for posting your results. Great topic, Lot’s of good information. Thanks for sharing Dr. Mohebi. Female hair transplants are definitely possible - but can be a little trickier depending on what is the root cause of it. Is it traditional male pattern hair loss, traction alopecia, or related to a hormonal imbalance? These are things you can discuss with a reputable, qualified surgeon, in which case, the same advice for men would apply here: Use this forum and the list of recommended surgeons to start researching and narrowing down your options. Find surgeons who have an impressive portfolio of women in a similar situation as you, reach out to them, talk to their reps, speak with former patients, and set up consultations with your top 3 choices or so. Research can be time consuming, but it's worth it in the end - and fortunately, you've come to a forum that does a lot of the heavy lifting for you in terms of really narrowing down who the best surgeons are. Dr. Mohebi has a good list here of the steps he recommends women take when determining the best option for treating their hair loss, which I think would be a great starting point for you. I hope this helps. Everything looks great, the temporal points are actually something I need to get addressed soon myself. Actually, Dr. Mohebi told me I need to get them done soon. So, if professionals are noticing I definitely need to do it. So, I feel you on that, the temple points are kinda like the cherry on top. That said, yours don't look that bad, sure they could be better, but maybe after a few years. Plus, once your happy with your new hairline, a few hundred grafts for the temple points will be quick and not as expensive. Today, I had the pleasure of visiting Dr. Mohebi at Parsa Mohebi Hair Restoration. I have to say that I was truly impressed with Dr. Mohebi and his staff. It is clear that his clinic and team take pride in their work and it shows in their results. It is no surprise that Dr. Mohebi is providing such excellent care to his patients given the fact that he belongs to the Coalition of Independent Hair Restoration Physicians, a group of surgeons that are carefully selected for their skill and consistent excellent patient results. I had the pleasure of witnessing Dr. Mohebi and his well-trained clinical staff perform an FUE procedure on a patient who also happened to be in the healthcare industry. The patient received 2,000 grafts that were placed strategically to maximize the illusion of density. The patient received grafts in his midscalp, left upper-lateral hump and lower crown. Since the patient combs his hair from left to right, the goal was to maximize the density in the sections that layer over the scalp. The patient returned to Dr. Mohebi and his team of expertly trained technicians because of the fantastic results he had received previously in his hairline. Dr. Mohebi, first created recipient sites, his reasoning was to minimize the time that the patients grafts spend outside of the body. After the recipient sites were created, he extracted the grafts via a 0.9mm punch using the Trivellini punch formerly known as the Mamba device. The device had a sensitive touch screen that displayed the various modes in colorful graphics. According to Dr. Mohebi, it is the only device on the market that can execute rotation, oscillation and vibration individually or combined. In addition, the Trivellini surgical punch could control the speed and time of each movement. Ensuring that the healthiest grafts are extracted. While Dr. Mohebi, extracted grafts, his technicians implanted them in tandem. It was impressive to witness such a well executed procedure being carried out with precision and efficiency. I am grateful to Dr. Mohebi and his staff for allowing me to observe them in surgery. I can without a doubt assure anyone that is interested in having a hair transplant with Dr. Mohebi, that he is performing ultra-refined follicular unit transplantation. Dr. Mohebi and his team took excellent care of their patient, ensuring that he was comfortable at all times, even bringing him his requested snack of ice cream. Thankfully, I was able to film most of the surgery, which I will be posting on YouTube soon, so stay tuned. Below are a couple of pictures of Dr. Mohebi and his team, me and Dr. Mohebi and the procedure itself. Thought I’d add a couple of more pictures of the procedure. Dr. Mohebi, seperates all of his grafts using high magnification, to ensure single hair grafts are actually single hair. He also, keeps the grafts in methodically thought out petri dish that he created. You will also see, he’s extracting grafts as his techs are implanting simultaneously. All are great choices, I went to Dr. Diep myself, but again all are great. I visited Dr. Mohebi today. I encourage you to check out my post I wrote about my visit. He’s underrated IMO, worth considering as well. Dr. Mohebi knocked it out of the park with me and gave me my ideal perfectly imperfect hairline. It was one of the things he was very adamant about educating me on when I had my consultation with him, and it's something he takes a lot of pride in. I remember him going into great detail about how designing a natural hairline is his own artistic outlet and how much joy he gets out of it. I'm happy to reach out to him for you if you want to do an online consultation, or you can reach out to him through his website. And no matter who you choose, the important thing is that you do lots of research, have consultations with your top choices, and then trust your gut when making the final decision on who to go with. Very pleased with my results. Dr. Mohebi was very thorough & detailed with information (initial researching) and later in the consultation. Bottom line: Everything Dr. Mohebi said about the procedure, the timing, the progress and the finished product came true. No surprises! Glad of that. Did a lot of research before I pulled the trigger on any doctor of this type. In the end, I chose Dr. Mohebi for his prior patient (results/reviews) and his detailed and thorough approach. Check out my before & afters. Happy. Hello everyone, This is Sanjar. One year passed from the date which I butchered in Colorado Surgical Center and most of you guys know about my pain and suffering which I had after that (so called) surgery. Thanks to all of you in this forum, my voice has been heard and I WON the free hair transplant contest which announced by good man and great surgeon Dr. Parsa Mohebi. The surgery took place two months ago and I'm telling you guys, it was amazing,amazing,amazing. No pain, no bleeding, 8 hours of surgery and I was conscious witnessing the whole process. Everyone was so friendly and professional at the highest level you can imagine. 2000 grafts and not a bit of discomfort. it was like a massage! to be honest after end of the surgery I was feeling I can have another 8 hours of surgery. it was pure pleasure! I'm not talking about my excitement and happiness. I'm just explaining my physical condition during the surgery. it was hard to believe specially for a person like me who had the horrible experience not a long before this amazing surgery. I had a delicious lunch and dessert around noon and it was great as well. I didn't need to go to pharmacy because after surgery my prescription was ready for me plus extra items like a travel pillow ( which was really high quality and comfortable and made me sleep like a baby without damaging the grafts) and special shampoo,etc. Donor area almost completely healed within 5 days! and before I forget I must say this: I didn't use any pain killer and medicine which Doctor gave me for preventing my face from swelling because I had no pain at all and my face didn't swell, just a bit of swelling and that's it! I'm telling you guys, this surgery was pure pleasure and I can't describe it with words. Thank you everyone! Thank you Thank you Thank you! My special Thank to good man and great surgeon Dr. Parsa Mohebi and his professional and friendly team. I'm uploading some pictures now and I will constantly update this topic with more pictures and share my happiness with you guys. Thank you again everyone and God bless all of you. P.S. First picture is one day before surgery, second and third picture is from the day of surgery and last picture is from one day after surgery. I will post more pictures soon.